Along with the fireworks and flags, most people make their Fourth patriotic by serving hot dogs and hamburgers, watermelon, potato salad and red, white, and blue desserts. Instead of eating food that doesn't have much to do at all with the history of our country (George Washington never heard of a hot dog! ), try some of these foods that were integral to the founding and independence of America. Corn is more American than apple pie since Native Americans were cultivating it for hundreds of years before the Colonies were settled. Settlers soon learned to make unleavened hoe cakes from cornmeal and a recipe for johnnycake appeared in the first American cookbook in 1796. Cornbread is one of the earliest purely American dishes. Forget about lemonade for the holiday. When the British finally pulled out after the Revolutionary War, George Washington and his troops were toasted with Madeira and port at Fraunces Tavern in NYC, so fill some wine glasses at your picnic. For extra points, make some arrack punch which was another drink they celebrated with. Arrack was a dark rum made from palm trees in Asia which made it to America via Britain. If you're serious about making it, you'll first have to find some ambergris, which is a cholesterol product made by whales (yeah, really). You can probably get by with making a rum punch as a close approximation. Legend has it George Washington could not tell a lie and admitted he chopped down a cherry tree. While this may just be a good story to remember him by (and inspire your children with), it’s true he did like cherries and cherry pie. 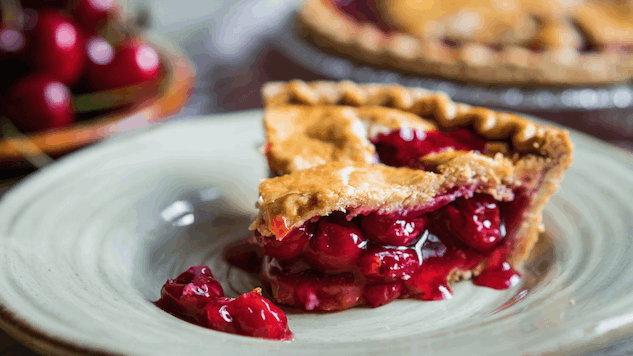 Cherry pie was often on the menu at Mount Vernon and pies were a food that colonists made in America just as they did at home in England. If you’re looking for a non-alcoholic libation to celebrate our nation’s birth, you can’t go wrong with tea. On December 16, 1773, Patriots dumped tea from three East India Company ships into Boston Harbor to protest taxation without representation (their act is now of course known as the Boston Tea Party). The tea was from China and was made up of green (Singlo and Hyson) and black (Souchang, Bohea and Congou) teas. Brewing some tea, hot or cold, is a great way to remember this act of defiance. Your fellow partiers may not be excited if you serve them the staples that were eaten on the Mayflower, but such fare will be authentic. The pilgrims were on board for 66 days and had to eat food that would last. Hardtack is a very hard, dried cracker, made from flour, water and salt. It lasts years without going bad and was a reliable food for those making the journey (it was also a staple for Revolutionary soldiers). You could easily substitute some saltines on your table. The pilgrims also chowed down on dried meat on their journey to freedom, including cow tongue. A spread of clams, mussels and oysters is sure to delight those you are celebrating with and it’s a great way to remember American ingenuity. After the pilgrims made landfall on Cape Cod, they had to learn to survive in a new environment. The waters had plenty of fish, but the pilgrims weren’t very good at fishing (and they also had brought the wrong size hooks with them), but they were able to gather shellfish and enjoyed this bounty from the sea. Each soldier in the Revolutionary War was given daily rations that included meat (beef or pork), dried beans or peas, bread or hardtack, and beer or rum. The beans and pork were often cooked together to make baked beans. Baked beans was a familiar dish to the soldiers because New England colonists often made this dish on Saturday and kept it in the oven until Sunday dinner since no cooking was allowed on the Sabbath. A pot of baked beans is sure to be met with approval at your table and provides food for thought about the sacrifice those men made for freedom. People won’t be fighting over this dish at your party, but it matters because it is the only thing history tells us that was served at the very first United States State Dinner, held on May 29, 1789 at George Washington’s presidential residence in New York City. Guests included the Vice President, ministers from France and Spain, the Secretary of Foreign Affairs and the Speaker of the House. If you want to stump people as to what on earth you’re serving (but still please their palates), whip up some syllabub. Syllabub was on the menu for the grand opening of the newly built White House on New Year’s Day in 1801 when John Adams was president. This dessert consists of cream and sugar and lemon that are whipped then folded together with wine. While drafting the Constitution, the Continental Congress often dined at Philadelphia’s City Tavern. Pepperpot was a popular dish at the time, a stew made with beef tripe or pork, vegetables, greens and sometimes cassava. The City Tavern has been carefully rebuilt with a menu true to the times and pepperpot is on the menu. A pot of pepperpot might not be what your guests are expecting, but it’s a great reminder of the way our Constitution was written.